The Hubble Space Telescope's image of galaxy NGC 922 reveals that it could have collided with a smaller galaxy 330 million years ago. 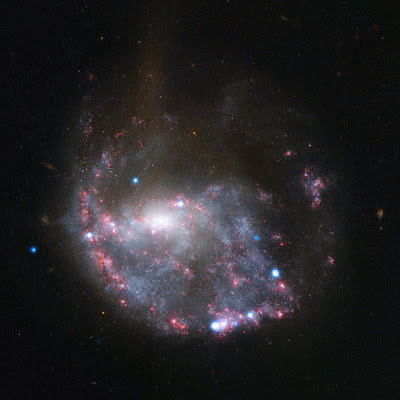 The shape of the galaxy suggests that the collision may have happened right in the center of of NGC 922. When two galaxies collide, it does not resemble nor is it similar two trains crashing into each other. It is a more complex process where the two start to interact with each other because of their gravity. The interaction of the one to the other makes both galaxies pull and push towards each other like two tangled nets in the ocean. They may start eating matter from the other. Sometimes they merge into one galaxy while other collisions retain their shape and material afterwards. Galaxy collisions are common in the universe. It is estimated that in about 4.5 billion years, the Milky Way galaxy will collide with the Andromeda galaxy to form one giant elliptical galaxy. Collisions are better defined as gravitational interactions of two galaxies on each other. Bright pink nebulae almost completely encircle a spiral galaxy in this NASA/ESA Hubble Space Telescope image of NGC 922. The ring structure and the galaxy’s distorted spiral shape result from a smaller galaxy scoring a cosmic bullseye, hitting the centre of NGC 922 some 330 million years ago. In Hubble’s image, NGC 922 clearly reveals itself not to be a normal spiral galaxy. The spiral arms are disrupted, a stream of stars extends out towards the top of the image, and a bright ring of nebulae encircles the core. Observing with NASA’s Chandra X-ray Observatory reveals more chaos in the form of ultraluminous X-ray sources dotted around the galaxy. NGC 922’s current unusual form is a result of a cosmic bullseye millions of years ago. A smaller galaxy, catalogued as 2MASXI J0224301-244443, plunged right through the heart of NGC 922 and shot out the other side. In wide-field views of the NGC 922, the small interloper can be still be seen shooting away from the scene of the crash. As the small galaxy passed through the middle of NGC 922, it set up ripples that disrupted the clouds of gas, and triggered the formation of new stars whose radiation then lit up the remaining gas. The bright pink colour of the resulting nebulae is a characteristic sign of this process, and it is caused by excited hydrogen gas (the dominant element in interstellar gas clouds). This process of excitation and emission of light by gases is similar to that in neon signs. In theory, if two galaxies are aligned just right, with the small one passing through the centre of the larger one, the ring of nebulae should form a perfect circle, but more often the two galaxies are slightly off kilter, leading to a circle that, like this one, is noticeably brighter on one side than the other. These objects, called collisional ring galaxies, are relatively rare in our cosmic neighbourhood. Although galaxy collisions and mergers are commonplace, the precise alignment and ratio of sizes necessary to form a ring like this is not, and the ring-like phenomenon is also thought to be relatively short-lived. The chances of seeing one of these galaxies nearby is therefore quite low. Despite the immense number of galaxies in the Universe, this is one of only a handful known in our cosmic neighbourhood (the Cartwheel Galaxy being the most famous example). Observations of the more distant Universe (where we see further into the past) show that these rings were more common in the past, however. Hubble’s image of NGC 922 consists of a series of exposures taken in visible light with Hubble’s Wide Field Camera 3, and in visible and near-infrared light with the Wide Field and Planetary Camera 2.